Giovanna Battaglia is a fashion editor for L'Uomo Vogue. I am huge fan of her style because she always looks oh so chic. It was recently announced that Giovanna is the new "it" girl featured in Eddie Borgo's Spring 2011 lookbook. Vogue I featured Eddie Borgo's jewelry in my very first post. Eddie Borgo Giovanna is pictured strolling along in the Maison Martin Margiela 22 Wedge Boots CIRCA 2009. 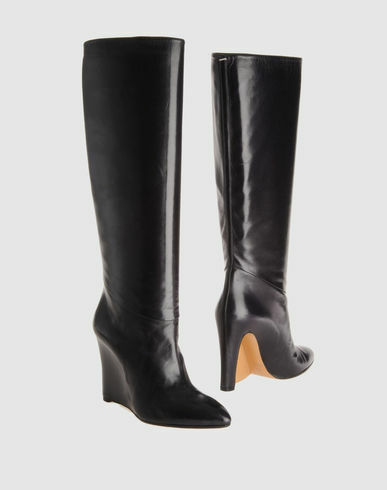 Mr. Margiela manages to create a gorgeous faux wedge heel boot. ﻿﻿﻿﻿﻿ If you want some Margiela magic head on over to Yoox.